Don’t let the groms have all the fun! Our Have-A-Go Wednesdays are an opportunity for older members to try all the cool stuff the nippers get up to. The session is multi-level and runs according to conditions and what people want to do. Most evenings involve a bit of swimming, board paddling or Stand Up Paddleboarding (SUP), jumping off rocks and playing in the waves. A full wetsuit is essential. Slippery Eels is a sea swimming group that runs every Monday evening during the summer from Trevaunance Cove. It starts and ends with the changing of the clocks, meeting 7.30pm at the clubhouse (time may vary depending on sunset). 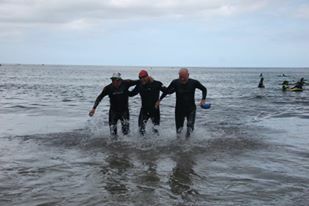 Explore the cove and get fit with a bunch of likeminded swimmers. A full wetsuit and swimming hat are essential. Swimming hats are available to purchase from the club.